FlagandBanner.com will fly pink Arkansas flag along with pink ribbon flag the month of October in support of finding a cure for breast cancer. Woman-owned company, FlagandBanner.com, will fly a pink version of the Arkansas state flag throughout the month of October in support of finding the cure for breast cancer. The custom made flag was manufactured onsite in 2017. 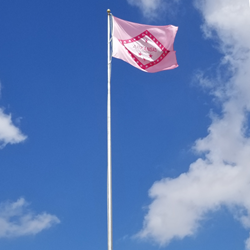 The trend of flying a pink state flag began in 2015, when a FlagandBanner.com customer, Geoffrey Jackson, purchased a pink New Mexico flag in honor of his wife who lost her fight against the disease. His story was reported in FlagandBanner.com’s magazine, Brave, last October. After the story ran, pink state flag requests skyrocketed. FlagandBanner.com reports making pink versions of at least eight different state flags. In business since 1975, FlagandBanner.com carries more than 20,000 products including flags, poles, hardware, accessories, banners, bunting, clothing, home decor and more on their website. Visit their historic showroom located at 800 W. 9th Street in downtown Little Rock, Arkansas. Open Mon-Fri 8-5:30 and Sat. 10-4, closed Sundays. The company also manufactures custom flags, banners and other custom products. Orders for custom made pink state flags can be made through the FlagandBanner.com website as well as through the sales department or retail store front. For more information about FlagandBanner.com visit them online or call 1-800-445-0653 to speak with one of their friendly flag experts.